Power consumption is the amount of energy that is used. Power factor is a value assigned to the phase angle difference between real or true power and reactive power created by inductive or capacitive loads. Power factors are determined by the percentage of attached load which is either inductive, capacitive, or resistive and how each works against each other and the benefits of that struggle. Lower power factor means that our electrical systems are being worked harder, creating higher current levels to achieve the same amount of work. Power systems providing electrical source for attached loads are designed in most cases to handle power factors as low as .8 before additional heat is generated, lowering efficiency and increasing cost to supply the current output capacity at the engineered voltage output levels of the power source. It is critical when sizing power systems to take into account the different type loads and how their characteristics will effect the power system. Insufficient sizing of the power system in relation to the attached loads will not only cost more money for operation but also damage loads attached to the power system as well as the system. 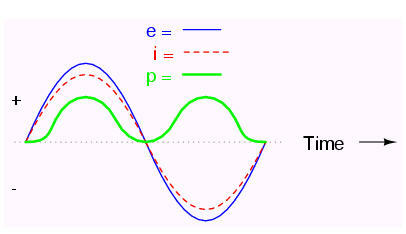 The sine wave for voltage and current are considered to be in phase resulting in a unity or power factor of 1. Loads with power factors of 1 use most all energy of the circuit. 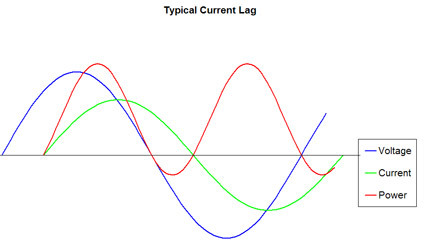 The sine wave of the voltage and current of an inductive type load are considered to be out of phase resulting in a lower power factor and an additional strain on electrical systems.